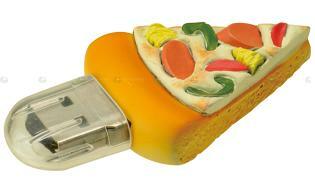 Here we have another entree in the category “sticky foods”: The USB Pizza Flash Drive! It’s a great 2 in 1 deal as the pizza slice is also a pizza stick. Just dip it into your favorite computer and enjoy the various season toppings like pepperoni, artichoke and pepper. You can order your pizza flash drives mini (1GB), medium (2GB), large (4GB) and extra-large (8GB). With a crispy plastic crust and baked al data, pizza memory sticks surely deliver. And best of all: You can have them here as well as to go! loving your memory sticks, the tree ones are brilliant and i love the food ones, how original, make great pressies for my Family who all seem to use them! great site!! !, will pass this to my friends, hopefully i may get one for my Birthday!!! 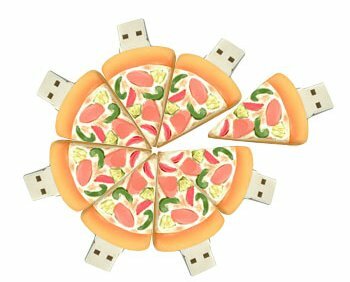 Pizza USB! It’s something that you would like to have for your USB collection. It’s really affordable though.